Last edited by hairy_scotsman on Fri Mar 27, 2015 11:36 pm, edited 1 time in total. Last edited by DrG on Tue Sep 16, 2014 6:51 am, edited 1 time in total. I don't anything about how these things work in the US, but didn't the state already give them the money? Maybe. The V8SC deal really seemed odd...like COTA never wanted them. They pay the subsidy per event, after the event, based on attendance projections & economic impact projections from the venue regardless of actual performance on race weekends. That has been my big beef with the subsidy. I never dreamed it was this sordid. The state has not paid out any subsidy yet for the 2014 USGP or any other future events, so I guess future subsidies could be in doubt. Looks like the 2014 US Grand Prix could be the last in the USA for a while then. The track itself is brilliant, everything else about the race not so much. It's overinflated, not really near all that much and the organisers seem unable to get someone tiddled in a brewery. My question is if this does end up tiddled up a wall where does that leave Haas in 2016? Part of the reason he wanted in was because there was now a race in the USA, without it his team probably stand a lower chance of getting sponsorship. Need some help here. What do the bold portions mean? I am a bit confused by your comment "not really near all that much". Austin is really a remarkable city and very, very active. It is considered to be one of if not the live music centers of the US, it is quite cultured, despited being in Texas, and the city is over 1,000,000 in population with the restaurants and shopping to accomodate such numers. And... it is the home of some great barbeque! San Antonio is but 90 miles away with a whole new set of activities and inbetween is a water park that has been ranked #1 in the US for many years. What is it missing? One other plus... Austin is an political oasis in ultra conservative Texas. Oh I wasn't meaning that Austin is a ghost town, just that with the prices the Grand Prix brings there isn't much incentive to go anywhere else. I know that the British Airways service to Austin, rather new I believe, has been doing very well but it is full of business people rather than people travelling for leisure. If there was a Grand Prix near New York then plenty of people would make a holiday of it to NYC as well, likewise if it was near Las Vegas or California or in Florida. I know a couple of people who are going to NYC before heading down to Austin but they've said it has been a complete pain to organise and pay for. Stick the COTA track near New York and IMO you'd have the perfect storm for a great American F1 race with a very steady future. But of course that can't happen. I think the main issue has been the prices though. Just like the British Grand Prix everything seems way more than many of the European and Asian rounds of the championship and accommodation and travel is just as bad. I'm also sure Austin will keep on growing and if the Grand Prix can hang on in there for a few more years then the discussion we are having may be completely redundant. "Stick the COTA track near New York and IMO you'd have the perfect storm for a great American F1 race with a very steady future. But of course that can't happen." Do that, and I wouldn't go. Once in New York was enough for me, and 5 or 6 times out of JFK was 5 or 6 too many! COTAs biggest problem isn't Austin, it is... surprise, surprise for F1 and Texas... politics. COTA's biggest problem is its management. Laura I agree with you that the track is brilliant. Hellmund's layout is top-notch & has been a hit for drivers and fans alike. Not sure where this would leave Haas, as he seems to be intent on using the F1 team as a vehicle to promote awareness of Haas Automation more than simply as a moneymaker in its own right, afaik. I think a lot of people would see it as a great chance to tick not one, but two things off the bucket list though. Go to a Grand Prix and go to New York. I myself loved NYC, I grew up in a city and I live in London today so it was right up my street. COTA seems to have terrible management issues at the moment which cannot be blamed on F1. F1 has it's problems, and it certainly has created plenty of it's own in the USA but this time you have to wonder if it is at fault as much as it was with Indy. The track is great, the racing has been great, the drivers love it and Bernie even seems happy with it. Yet somehow it is still on the brink of failure. I wasn't necessarily saying that F1 is the problem, only that politics (which can be nasty in F1 and in Texas) enter into the problems, be they internal politics, local politics or state politics. The only "blame" F1 has in this case is the fee they charge which make it damn near impossible to support an F1 race without state and/or local subsidies, as Indy found out. BTW, Hairy... are you going to be at the Vintage Racing event next month? I have my flight tickets in hand and can't wait. Over 650 vintage cars...AND a Trans Am vintage race! Of course, that means I won't be there for the F1 race this year, my first miss on that at Cota and my first miss since 2000... but all is well! I'll probably be there. You'll love it. That event has the potential to be the best event at COTA...if COTA only understood its potential and how to promote it. OMG.... if HALF those cars show up this year I will love it, my friend!!! I was excited before seeing your pics, now that date can't come soon enough! There will be more this year. IIRC last year the SVRA folks said there were about 550. Paddocks are wide open and gawking is encouraged by the owners. Bring comfortable shoes and a good camera. I seem to be one of the few who don't care for COTA. I think there are far better circuits in the US alone that could hold a grand prix. 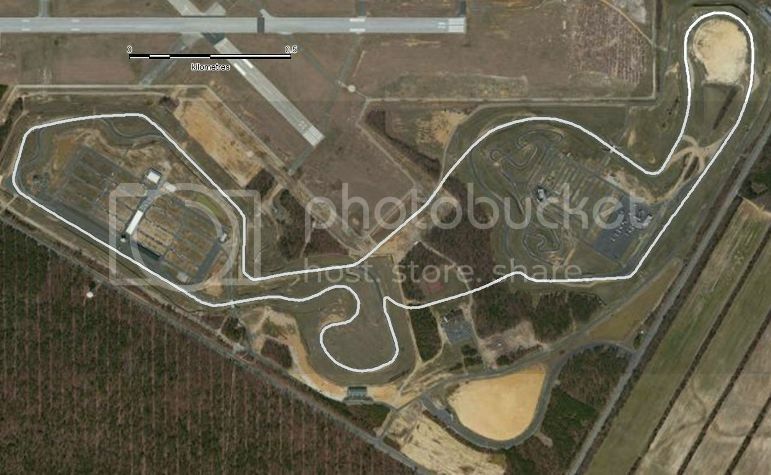 Personally, I think New Jersey Motorsports Park would be the best place. A short bit of track to connect the two circuits and youd have a great Grand Prix track, imo. It's already FIA Grade 2, iirc, so the upgrades wouldn't necessarily be huge or expensive, and it has that New York connection Laura was talking about. Building a new track was a waste of money, imo. Got the camera, got the shoes, and glad to know about the open paddocks. I was at a Rocky Mountain Vintage race weekend a couple of weeks ago, and some of those drivers encouraged me to stop in and say "hi' ... glad to know that I will be able to do it! Hope my brother is ready to spend all day x3 there... cuz he is gonna have a tough time getting me to leave!!! Angus... I sure hope you don't get your wish, I will take a Texas, west of Texas, north of Texas, south east of Texas race any day over anything in the Boston-New York-Philadelphia "corridor". The closest I would want to come is DC or in the area south of there. Ideally, the mid-west or High plains would be great, but I will settle for COTA. Too bad that Indy was smart enough to tell Bernie to go to *#)Y&#, I enjoyed that course too. BTW, you are indeed among the few that don't care for COTA... not sure why, as it seems as though it is a fine course to me. If they had not "wasted" that money, we likely would not have a USGP today, nor for the past two years. It is not my money, but I sure have contributed to helping pay for the place! Angus... I sure hope you don't get your wish, I will take a Texas, west of Texas, north of Texas, south east of Texas race any day over anything in the Boston-New York-Philadelphia "corridor". The closest I would want to come is DC or in the area south of there. Ideally, the mid-west or High plains would be great, but I will settle for COTA. Oh BTW, one big problem last year was that COTA had about 2/3 of the circuit closed to spectators...so that really limited photo angles. Sad but initially part of the allure of this race for Americans was the pricing. It was less expensive than any other GP and that was partly how it was sold to the developers. Even last years race I saw constant advertising for event tickets at very affordable prices. I think I remember tickets starting at $75 per person for a regular ticket and some grand stand tickets with pit passes going for as low as $350, which is an excellent value and a fair price. Now I see on their site they've gone all Ecclestone on the world and the rates are ridiculous. THIS is precisely why American GP's have died sudden deaths here in the states numerous times. It is just unbelievable. This sisn't some third world country where things like gross misappropriation of funds is taken lightly and Evil Little Troll and his people cannot make back alley deals as if it's the wild west. Furthermore, if indeed the deal was done without the proper procedures being followed, rest assured someone is going to be charged with a crime and I can see the Texas State Attorneys pursuing it for as long as it takes for someone to answer for it and recoup the funds. It's a superb track and to would be a shame if F1 didn't race there every year. In that bold portion are you referring to the USGP in Austin? Or the USGPs in Indy? Indy was inexpensive. Nothing about the USGP in Austin has ever been cheap. Not the seats, not the parking, not the food or drinks. Not anything, and F1 pit passes have never been sold by COTA for $350. No F1 seats for $75 either.In fact, since its inception, it's been one of the 3 or 4 most expensive GPs. The pricing has been the main sticking point for American fans. And what do you mean by "developers"? The current ownership, which booted out the founder of the GP, Tavo Hellmund, are the ones you can blame for the high pricing. They insisted from the beginning that they would cater to higher-end clientele (in opposition to Hellmund's strategy of going with lower prices and trying to attract as many fans as possible, making as much money as possible on volume and growing the sport in the States). The current ownership has never wanted to sell seats cheap or even at reasonable prices. As for the remainder of your post, I agree. That chip on your shoulder is showing big time, Blake. Nope, not a chip, Billy.... I have been there, found the general attitude to be one of rudeness and lack of service and too "busy" to give anyone the time of day... and JFK has to be the rudest airport I have ever been through, and I now avoid it whenever possible. I have always found it embarrassing to think of the masses of people who's first exposure to the US of A is JFK and it's workers. Of course, there are some very nice people in New York, just not enough of them speak out. To be fair to the state however, I would say that I found upper New York is quite the opposite, pleasant.. considerent people who actually act as though they are glad to see you, and give you good service at restaurants and hotels, as well as event sites, etc. Maybe the city is just too many people trying to occupy one space. So, I guess you can call it a "chip", I see it as a opinion based on experience (6 times there if you include JFK & LaGuardia). Sorry, Pal, I call it as I saw it. The problem is not mine, it is New York City's. If it makes you feel any better, I found Boston to be only marginally better! Of the big cities on the east coast, I have found Washington DC, and (though I was only there one evening), Baltimore, to be very much more pleasant when interacting with the people. Am I the only one who thinks the circuit itself is crap? It has no flow, has corners copied from other tracks and is way too long. I for one won't miss it if it gets taken off the calendar. Are you making that based solely upon watching it on TV, or have you been there? You can't appreciate the nuance of this circuit watching on TV. It flows with the terrain and has lots of elevation change that is undetectable on TV. Having driven there a couple of times I have to say the east side (T1-11) is brilliant. The stadium section is my least favorite area, but T15 - 20 are very nice. The circuit itself is the least of COTA's problems. Personally, I think New Jersey Motorsports Park would be the best place. A short bit of track to connect the two circuits and youd have a great Grand Prix track, imo. Something like this, measuring in at 6.87km, similar to Spa but much flatter? Nope, not a chip, Billy.... I have been there, found the general attitude to be one of rudeness and lack of service and too "busy" to give anyone the time of day... and JFK has to be the rudest airport I have ever been through, and I now avoid it whenever possible. I have always found it embarrassing to think of the masses of people who's first exposure to the US of A is JFK and it's workers. Actually I've always found LAX to be the worst when it comes to rudeness. Plus, bags have been known to show up at your final (non-US) destination a couple of days late thanks to US customs searches, resulting in bags missing connections...and that's just travelling through in transit. When travelling for business to the North America we just try to avoid the US altogether. Direct to Vancouver is a good alternative and if we absolutely must go through the US, e.g. getting to the Caribbean, then DFW is the way to go. Yep. Although NJMP has got some decent elevation change, it's not on Spa levels I agree. Looking at some on boards it might need widening at points, and obviously the pits and facilities upgrading, but other than that I think it's a great track. I suppose this forum is not the right place for this discussion, but my Mom, in her 80s, was in New York, and just couldn't get over how extraordinarily polite everyone was to her, getting out of her way, holding doors, always trying to help. It was a huge change from rural Connecticut, I'll tell you that. So while I can't vouch for airports here or elsewhere, I'm still going to go with chip on the shoulder if you hated the city, I'm thinking you saw what you wanted to see (or else stuck to Times Square, which has only tourists and grifters anyways ). Again the bolded part. How much is the pricing down to Bernie's stupid astronomical fees he charges to host the race. The organisers have to recoup the money somehow. The last 2 years ticket offerings were featured during commercial breaks and the first season on Speed Channel they promoted it to death and I remember them being rather inexpensive. So much so that I almost drove from Florida with my brother in law last year but decided against it due to my failing hip replacement and all the walking I'd have to endure. In fact here's something I found via a quick google search. I don't know about the others, but those Turn 12 prices look about right. The first year, I was in Turn 9 and paid about $400 for the tickets. Last year, I was in Turn 15 seats and I think it was about the same. This year it is the Vintage racing, and much, much, much cheaper seats. Yeah those are right. Those don't include the most expensive tickets: Main GS, T1, and T15. They're from year 1. Far cry from those other prices you mentioned. That's why I was wondering if you were talking about F1 in Austin. AND they've all gone up since then. I dont think they need to be at all concerned with people coming from Europe. Having the track South means it is closer to Mexico is C113 million, and would be a target for many other countries as it is the only one that does not mean crossing an ocean or a trip way down to the pointy bit. Texas its self has a pop of C30million with some claiming at least as many unofficial residents. I liked what I saw on TV, and the teams and drivers seemed to love it. It's a great track and a great city. Very friendly, inviting folks. Re: the Mexican crowd, I remember someone claiming there were 40K fans at the USGP from Mexico, which is ridiculous. Even COTA's own numbers said only about 15% of the crowd was from outside the United States.